Whilst living in Guernsey you are never far from someone that is complaining about the state of the roads in Guernsey. Either they’re complaining about the intolerable surface condition, or they’re complaining about the number of closed roads around the island. The question I often ask, though, is are these complaints justified? Is there really a very high level of road closures in Guernsey? And today I think I may just have found the answers to these questions. I website has been launched by the States of Guernsey to allow islanders to keep an eye on road closures. The site is viewable at Iris [dot] Gov [dot] Gg. 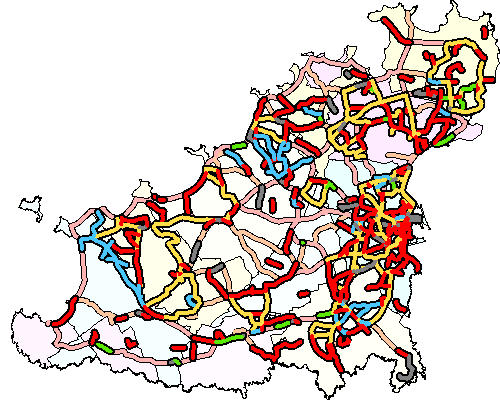 This picture is a map of the roads of Guernsey. All the red lines are closed roads, the blue lines are temporary one way roads, the green lines are temporary traffic lights, the yellow lines are diversions and the grey lines are other temporary traffic alterations. Anyother line, if you can find any, are roads which will/have not been closed during 2003. So, is there a high level of road closures on the island? I leave that decision up to you, I certainly know what I think.